The journal art I showed yesterday really got me going and of course I had to make more! So yesterday I got out a second sheet of paper and put another piece together. I again used many different materials but the coolest thing to me is the red heart. 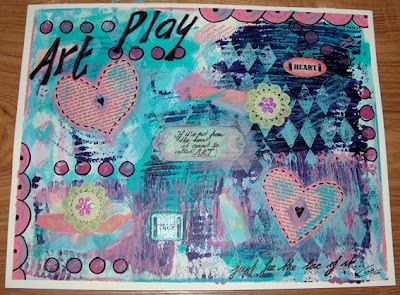 It is a colorcopy on watercolor paper of a wooden heart that was once a gift with purchase of a home decorating magazine. My first idea was to use the wooden heart itself on the piece, which looked really good. But then I got to thinking that maybe I would like to frame this paper one day and then the thickness of the wood would get in the way. So I decided to colorcopy it. My plan is now to sometime in the future make a similar style work on canvas and then use the original wooden heart on that. 'Real' things do add something extra to a piece of art I think. Just now as I was clearing up my worktable again from all the remains of these two paper works I found some left over collage material that I had taken out to use, but didn't. They were just a book page, a cut rose and a cut butterfly and for some reason I felt the need to put them together to form a very small collage that I will probably paste in one of my journals. I added some lettering and crayon and that was that. It's very simple and I don't even know if one could call it art, but I like how you can put some scraps together and still come up with something that's nice to look at. Better than throwing it away! A special shout out to my tenth follower! I feel so silly saying this, but just one of you is a complete miracle to me. 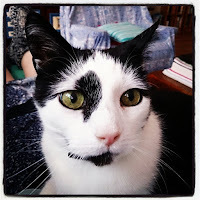 Thanks so much for liking my blog (that also goes for those who respond outside of the blog). It helps to know there's a small group of people that I am not boring to death with my artsy ramblings ;-) I may not respond to a lot of blogs, but I love looking at other artsy blogs myself. PS: it may interest you to know that the book page in the 'left over' piece is from the memoirs of Casanova! Very apt I think! For the past few weeks I have been in total art journaling mode. 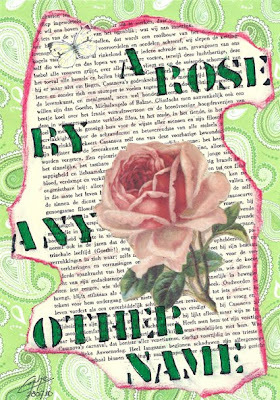 I love art journaling and I love working on books. But I'm nothing if not fickle and I really needed to do something different yesterday night. Since I cleared my table it was easy to pick up something else and I decided to do some work on a sheet of paper. 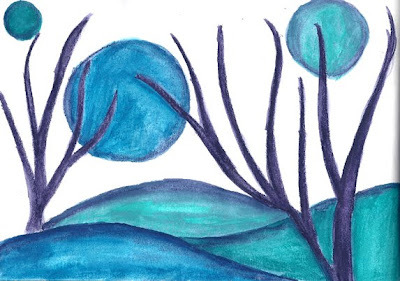 I got out my big drawing board, taped some thick acrylic paint paper to it and got to...PLAY! Yay! My, did I have a good time making this! I felt like a kid in an art supply store! ;-) My only challenge in this one was not to use any realistic pictures and just do something more abstract. The size of this piece is 32 x 41 cm (12 1/2 by 16 1/8 inch) and the paper is cold pressed 400 g/m2 ( 190 lbs). It is absolutely beautiful paper and I was lucky to get it on sale a while ago. I used just about every art supply at hand, from gouache to acrylics, from mechanical pencil to artist's brushpens, foam stamps (I love my foamstamps) and even some scrapbook embellishments. 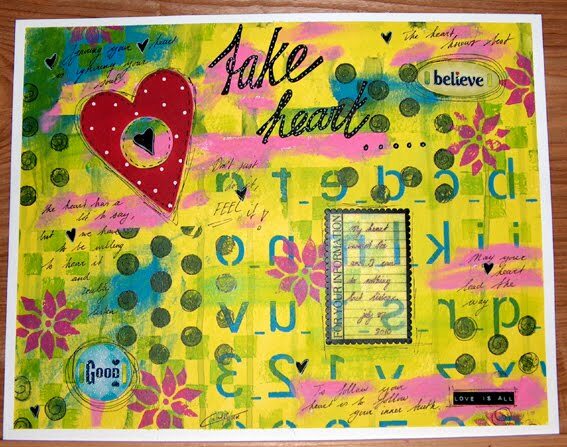 It also got me thinking about something I've been wanting to try for a while and may have succeeded at with this piece and that is to get the art journaling out of the art journal. 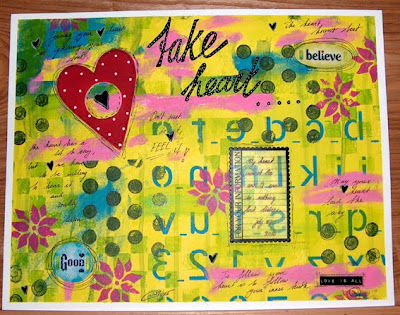 What I mean by this is to make art on different substrates that is still art journaling. I think I like to call it journal art ;-) This piece of course is all about play and the making of art because I love it and for no other reason. That's why it says on the bottom right "Just for the love of it" and that's the title I have given to this piece as well. Okay this is a bit of a silly post, but I'm so happy with this little thing that I just have to share it. Now imagine it twice as bad and you get the idea of what the place looked like. Let me be frank and say that a studio in itself should not be a tidy place in my opinion. 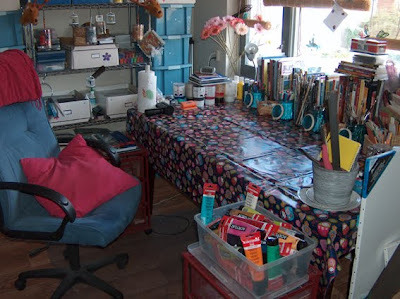 I mean, that looks nice and all, but to make stuff, especially mixed media, means you need supplies and tools around you at hands reach and with me that means that things start to pile up not only on the table and the little rolling drawers, but on the ground as well. 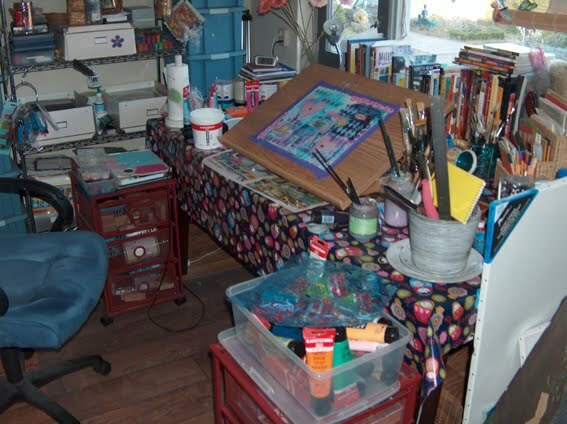 A very clean studio in my view is a studio where no work is being done. 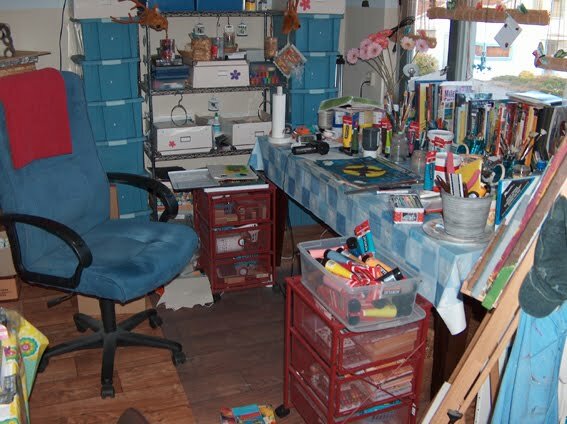 That being said, if after a certain amount of time I don't clear some stuff away I might one day not be able to get inside anymore, so ... a quick sweep of my studio does help to keep things...ehm...manageable. More heat has washed over our country and I am getting a little tired of it frankly. I am now sitting behind my computer in my studio wishing I was...well...someplace cooler. But it's been a week since I posted and I did want to show you what I am working on right now. I'm working on three spreads in my ALMBH journal. To get more in the spirit of Kelly Kilmer I am trying to challenge myself by just using collage and penwork. It is really really hard for someone who is as in love with acrylic paints as me. Now, don't get me wrong, there's no rule against using paint in this class, but it is good to get out of your comfort zone every now and then and try something new or a little different from what you usually do. So...I am making three spreads with just collage, collage and more collage. I like how they are turning out and it is quite interesting to get into layering with just collage instead of paints combined with paper. What I also really like about this journal is how it forces me to use all the collage sheets I have accumulated over the years and all the beautiful scrapbookpapers that I own (and those are many my friends!). Aah, don't get me started on pretty papers! What some people have with beautiful fabrics I have with beautiful paper: it is often enough to just look at it and I am in paradise. I guess only fellow paper addicts can understand this. Anyway, this way they come to some practical use as well. As you can see the spreads are not done yet. I still have to do the penwork on it. Now that I like these spreads so much I am a little scared to go there though. I don't want to ruin these spreads. But I don't want to be a coward either, so hopefully next time I can show you how they turned out. So today you got a little 'Before picture' and soon I hope to give you the 'Finished pages'. Keep your fingers crossed! Several years ago my most artsy friend showed me these crayons that were unlike I'd ever seen before. They were very vibrant in color, looked like wax, but were water soluble. They were Caran d'Ache Neocolor II. Propably a lot of people have heard about them by now, but for me they were a revelation. Wow and wow again! I almost immediately (almost, it's hard to do some things immediately when you live on an island) went out and bought a tin of 15 crayons. 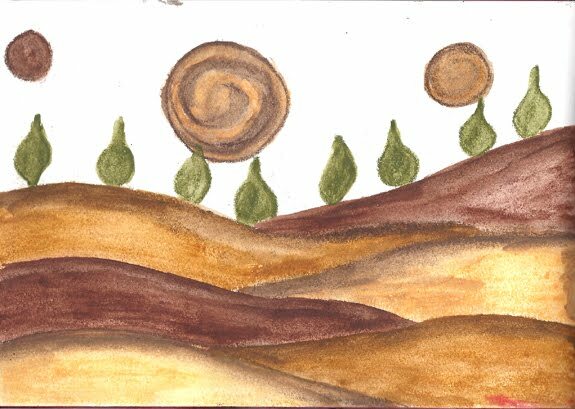 And here's the weird thing: they made me want to draw these strange landscapes with barren trees in them, empty hills and some objects in the sky. I have no idea where this came from, it's like the material just called for it. They reminded me a little of these alien worlds that you see in very cheaply done science fiction movies or old series like Star Trek. 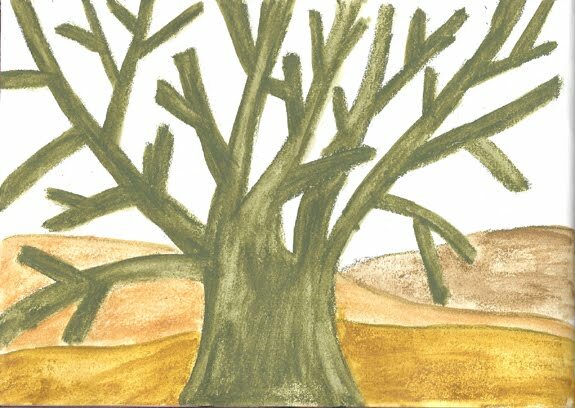 Some people take walks (so do I by the way), some people do breathing exercises (not me), some people stare into a flame (sometimes that's me too), but when it comes to art for me it is drawing these empty trees in their strange colorful landscapes that is like pure meditation. 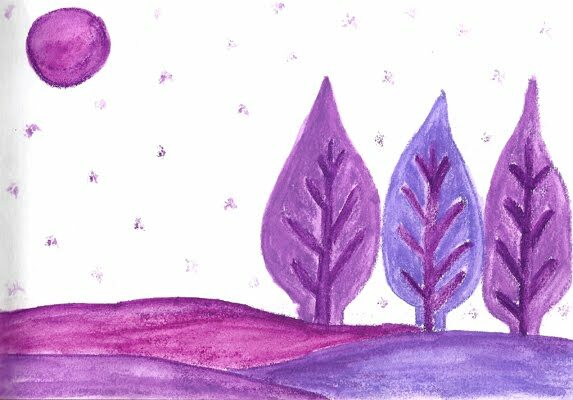 They are so easy to do and so relaxing and I can play with colors and different shapes and perspectives without any thinking. Over the years I have drawn quite a few and I've even done a series of atc's on them, but I thought I'd just show you a small selection from my 'dorrebomen book'. Just to give you an idea. The prompt from the ALMBH-class for this one was about the thing you don't want to think about. I would really like to not think about the high demands I put on myself. I always feel like I should be doing more and that I should be more productive in my art. 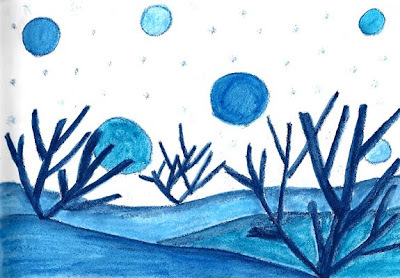 I journaled about how I would just like to enjoy my artsy passions and not worry so much about my own standards of productivity and outcome (whatever they are). I am learning that the process is the thing, but I would still like to have more to show for it in the end (paradox anyone?). We are being blessed with a few cooler days and I have the courage to sit in my studio again. Not to say that it's really cool in here, the heat of the past days always lingers longer in the higher regions of the house, doesn't it? It's going to be really hot again soon, so I might as well make the most of this reprieve. Last friday I had to go the main land for a meeting and even though that is just on the other side of the Wadden Sea it takes an hour and a half by ferry to get there and it's the same way on the way back (who would have thought?). That's three hours of roaming on a boat people and I am not one to just sit there all that time. Therefore I am always armed with my necessities whether I travel or wether I am on one of my hikes. It's a backpack with some basic art supplies, a journal and an e-reader. Ah, who was the genius who invented that little gadget? I love the thing, especially when I am under way somewhere. Thanks to some very cool friends I now have a supply of e-books that will last the next ten generations and I never have to shop for any books again...Ahem....That's in theory only of course, because books and me cannot do without each other and I cannot imagine a house without books ever being a home. Still I love my little e-reader when I'm away from home and it has served me well in the six months that I have had it. But I am so degressing. They were done in neocolor and later overdone with a waterbrush (another genius invention by the way for the frequent traveler). The patterns in themselves I don't find very special, but they are relaxing to do. The way some people do these zentangle-things that I cannot really seem to get the hang of. 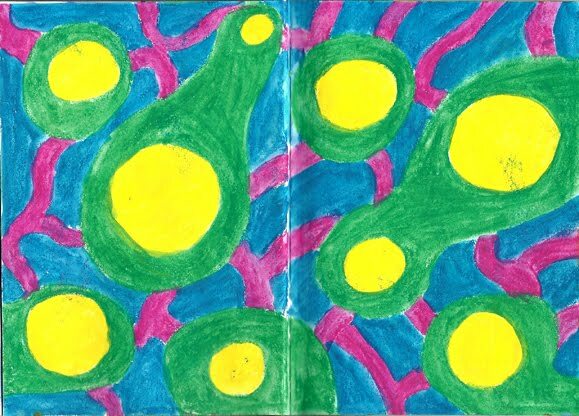 But the making of them gave me an idea to start a special sketchbook for patterns and backgrounds. 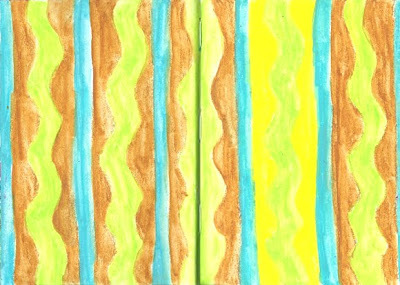 My idea is to then make color copies of these patterns/backgrounds and use them as collagepaper. That way I will have a slowly growing supply of personal papers available. So I have bought an A4-sized ringbound book and will use that solely for this purpose. Will let you know how it goes when the first patterns have been made. A sucker for art supplies of any kind I recently bought one of those letter...jeez, what do you call those in english? ...they punch letters on plastic labels, literally in Dutch we say letter thongs, but that doesn't sound right to me. Come on readers there must be one amongst you who knows what it's called? Now this card is a good example of a thing that I do with left over paint. I use these paper palets and when there is paint left after I am done with a project I will use any big amounts for the background of a journal or sketchbookpage, but the remaining layers I will spread out over the paper palet and then I will put down blanc cards on it and so print the paint on the cards. It gives a really nice structure to the paint. 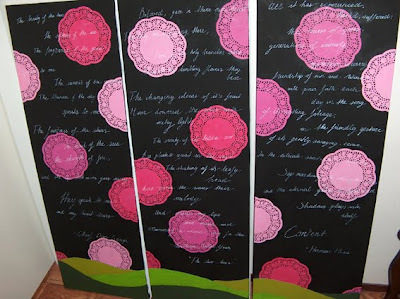 The printed on cards can then be used as backgrounds for new pieces of art or one can cut them up for collage fodder. This is one of those cards. This card is called "Repeat after me". 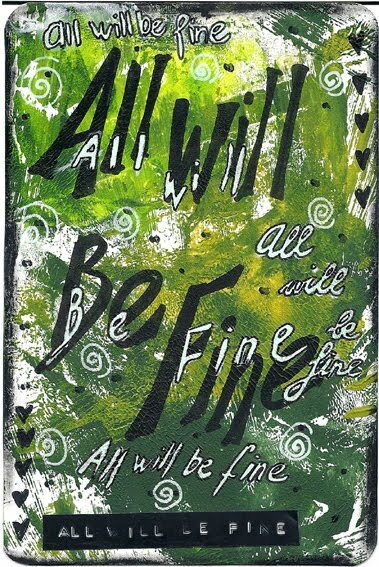 The words "All will be fine" are found on it over and over again as a kind of mantra to be repeated until you believe it. You can see the strip from the letter punch in the bottom left corner. Also for the first time I have used my round corner punch. It may be hard to believe but it has taken me years to actually find such a simple device and now I am glad I finally did, cause I think it gives the card a special look somehow. It was difficult to get the letters on. I have practically ruined a white paint marker on it, but well, she's family, so she's worth it, haha! Finally a kind welcome to three new followers! Yay! 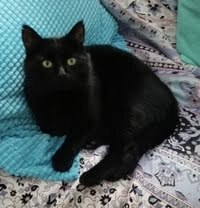 I was off line for a few days and quite surprised by it. I am still in that stage where even one follower is a miracle to me, cause...where do they come from?! Also thanks to all the nice responses through flickr (not everybody responds on this blog), with a special mention of my ALMBH fellow journalers and the great Kelly herself who must spend half her days responding to all the flickr uploads of her students! 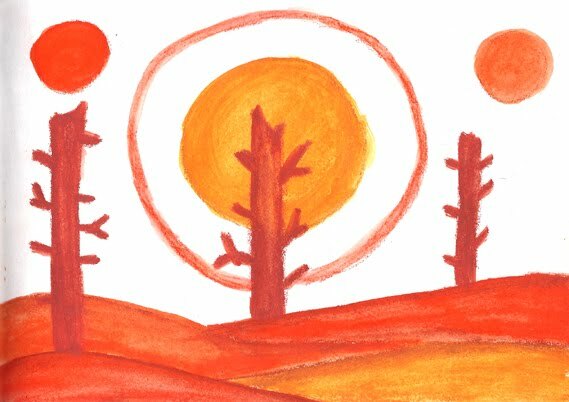 I'm off to do some art, before it gets too hot again!